Making a hole in a roof is many an amateur’s most worried moment. They know how do “solder-on” connectors, how to tune their amp, how to drive a ground rod, and they know they are deep trouble if their rooftop installation leaks into their home. Like they say, that which goes up….coax, cable, wire or support… then, water comes down. Each Roof System needs a specific Roof Penetration Technique to make a watertight roof flashing. Shingles, EPDM, Built-Up Roofing, Metal, Thermoplastics, Specialty Systems, and even Waterproofing Systems under “Green Roofs” all have specific techniques to make an effective penetration. It is not just getting a “Water Seal,” but for many of use reducing or eliminating “Thermal Bridging” is the goal of a successful roof penetration. Common techniques historically have ranged from just poking the cables through, caulking them at the surface of the roof, to dedicated roof portals with rain, wind, insect, temperature, Air-Transfer, Security and Lightening Protection built in. Between these two extremes fall most penetration styles. There is a huge amount of resource on the internet on how to work with each and every roof system. My profession puts correctly installing roof penetrations to the test daily. As there are far too many systems and conditions to write about each one, post a comment if you’re interested in some input on a roof penetration issue affecting your shack. For all of us involved with ARMAD 2007 who will be allowing our hobby to used as a tool to show thanks and appreciation to those that serve in the Military, and to our First Responders, let me first say thank you. Our Troops, their families, our Veteran’s, Military Retired, and all First Responders deserve our support. As Amateur Radio Operators we can display our appreciation, and allow the people from our communities to express messages that will help those that serve know that we care. Let’s show the people from our communities what Amateur Radio is all about this weekend as they gather at these events to show support. For many it will be the first time they have been exposed to the hobby. Some locations will offer fun things to do as we operate and make contacts around the world. These activities will draw people to this Amateur Radio sponsored event that normally would not have the opportunity to ever visit an Amateur Radio activity. Most Amateur Radio events are closed to the non – ham population. As we look toward the future, we must attract new people to the hobby. ARMAD offers us that opportunity. Have fun this weekend and work to make as many contacts as possible. Check in on the net frequencies, and also move off and call CQ on your own to work as many stations as you can so that we can allow our Troops, Veterans, and Retired Military members to hear uplifting messages that will boost morale, and let them know that America remembers and cares about them. Many of us are also affected, as we have friends, relatives, and spouses that have served or are serving in some capacity. We will be using one of many tools to let them know that America Supports Them. Many Military Support Groups network so that they can display a united effort. During ARMAD we can do the same as we use the Amateur Radio bands. We are asking Amateur Radio Operators to be on the air. All bands, all modes, and also are asking you to notify any Amateur Radio contacts that you have with Military Amateur Radio Clubs, Mars Operators, Veterans, and Retired. Ask them to be on the air to receive QSO’s from ARMAD locations, any other Ham’s on the air, and from non-hams that will be on for third party traffic. We want to have fun as we promote the hobby. We do not wish to bogg down the event with rules and regulations. We have sent out requests to scores of Amateur’s and Clubs to boost activity on the air. Many Military Support Groups, and Non – Hams are very interested in learning more about our hobby, and they like the idea of expressing support over the air. Some ARMAD locations will have special guests and activities to help make things go smoother as people observe our operation. These additions will draw people that would not normally attend an Amateur Radio event. This will give us the opportunity to recruit more Amateur Radio Operators. Our main check in frequencies are listed under “Event-Info” on the webpage. However, the event is set up like Field Day. You can set up anyplace and call CQ with ARMAD as a suffix. Also you can locate ARMAD stations, and work or ragchew them. Our main purpose is to use Amateur Radio as a tool to show thanks and appreciation to those that serve, and we also are trying to promote Ham Radio. ARMAD includes all Colition Forces, First Responders, and Medical people that work hard to serve our communities. Battery Technology has come so far along from the service monthly Lead-Acid wet cells I checked & serviced as a teen as part of my summer jobs, to the current starved-electrolyte sealed cells. One type I have had great luck with is the Odyssey Sealed Cell. I first put one into a show bike (Laverda Jota 1000 special model) on recommendation of the Laverda Club. The battery was half the weight and 2-1/2 times the cranking power. It also kept its charge between shows. The original technology was military and medical. I’ve put these into generator sets, hydraulic porta-packs, trailer brake systems, a couple motorcycles and industrial gear. They seem to keep their charge many times longer than a conventional battery. There are other options – currently I’m using Aircraft Sealed Cell batteries which you can sometimes get for free. Apparently some of these batteries are date stamped, and when they get too old they are replaced for safety reasons. There are some higher voltage aircraft batteries that you would need to use a step-down transformer to get 12-14v output. The one I am using for Island activations came from a Cessna C-182 and works the treat. Though much heavier than the Odyssey they have the advantage of being free if you are in the right place at the right time. Many of us have experienced it – the noisy effects of silver sulfide buildup on the variable inductors of our antenna tuners. What happens is over time a relatively high amount of silver plate on the coils reacts to form nonconductive silver sulfide. As our tuner’s tap (usually a roller) moves across the coil it often has less than 100% conductivity and becomes noisy. http://scifun.chem.wisc.edu/HOMEEXPTS/TARNISH.html is the simplist explaination of a method to use Aluminum Foil to draw off the sulphur and restore the silver conductive surface. Several recent reflector postings have covered the good luck other Amateurs are having using this technique. In each case take care, wear your protective goggles, aprons and gloves, and be sure to rinse your inductor clean of any chemicals when finished. 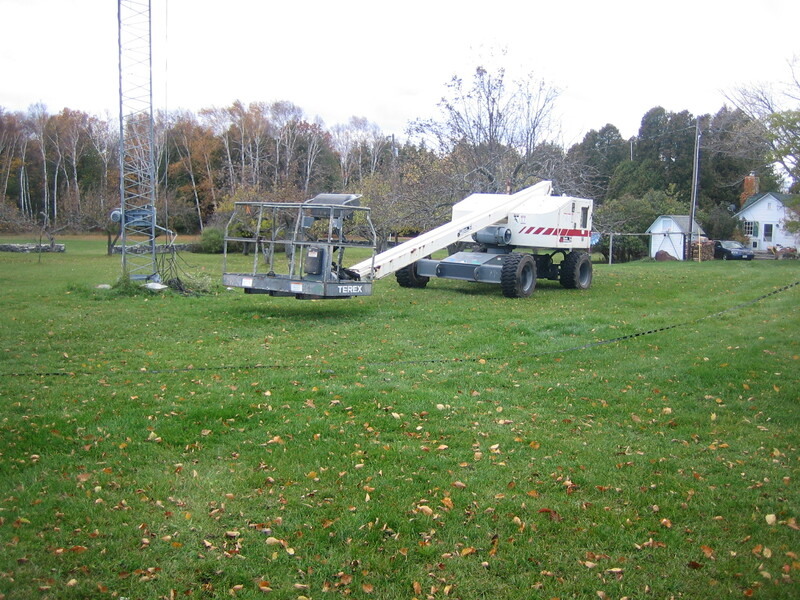 At the W9EVT/WI9DX Washington Island Hamshack servicing six (soon to be seven) towers with multiple antennas is quite a chore in climbing those towers that are climber-rated and bringing in a utility-type man-bucket truck to service the rest. Enter T-Rex or more properly a Terex 45 ft lift. Susan, George W9EVT’s XYL saw a business opportunity for a lift on the Island. When not in use at the W9EVT/WI9DX QTH the lift is earning it’s keep in the service of Island Contractors. If you can arrange it, this is the way to go. Putting our tools, supplies & gear on board, lowering the tower down to its lowest height and using the lift to work on projects as if they were on the ground. Now if I could get George’s XYL to convince my XYL that I needed a manlift too…. Periodically I would either get on air reports or hear it in the shack. RF getting out of my Alpha 78 amp and into either my transmitted audio or into the station audio. The problem seems worse using a Pegasus than with a Jupiter, but simply won’t go away. Research suggests that the combination of the TenTec radios with amplifiers expecting a different method of switching between Transmit & Receive inside the Transceiver is a combination prone to RF float problems. Ok, so with an idea of what was causing the problem, the TenTec rigs use a transistor to switch between TX/RX where tha Alpha expects the transceiver to have the protection of an actual RF switching relay. Home brewing an interface seems a simple enough option, but by the time one searches for all the parts, pays the shipping and spends the time, there would seem there should be an easier way, right? They even chose to show the AmpKeyer with a rig like mine. Sounds simple enough of a solution! Having over two dozen perfect 5 out of 5 reviews at eHam is reassuring. Having a PayPal option made this a couple keystrokes to order. I’ll have the needed power from the back of the TenTec and the installation should be straight forward. These units are popular enough that they have been on backorder, so hopefully Mike WB8VGE will be able to supply one in short order. Full report once the AmpKeyer arrives and is wired in!